The storyline in Sonic’s latest adventure could have easily existed within the Archie comic universe. After one of Eggman’s plans finally comes together, Sonic is taken captive and locked away in an off-world prison. The hedgehog’s homeland soon descends into chaos once Eggman’s army takes control, prompting Tails, Knuckles, Silver, and Team Chaotix to form a band of freedom fighters. From a secret base they formulate strategies to take back captured zones and counterattack Eggman’s forces, hence the crimson-hued ‘generic Che Guevara T-shirt’ style presentation. Your custom-made avatar enters the fray as the newest member of the resistance. There’s a choice of different animal types, each with a unique skill, and they can be kitted out using the wealth of colourful attire that unlocks at the end of each mission. Around 500 parts in total, ranging from Mega Drive branded sneakers to shimmering bodysuits. If this gimmick sounds a little pedestrian, that’s because it is. There’s nothing wayward in Sonic Forces to make you question what going on inside SEGA’s marketing department. No werewolves, princess smooching, or anything of the sort – this is the most ordinary Sonic game we’ve had in a while. It also forgoes everything Sonic Boom forced onto fans, meaning Knuckles is no longer the comic relief character. Vector now fills that position. 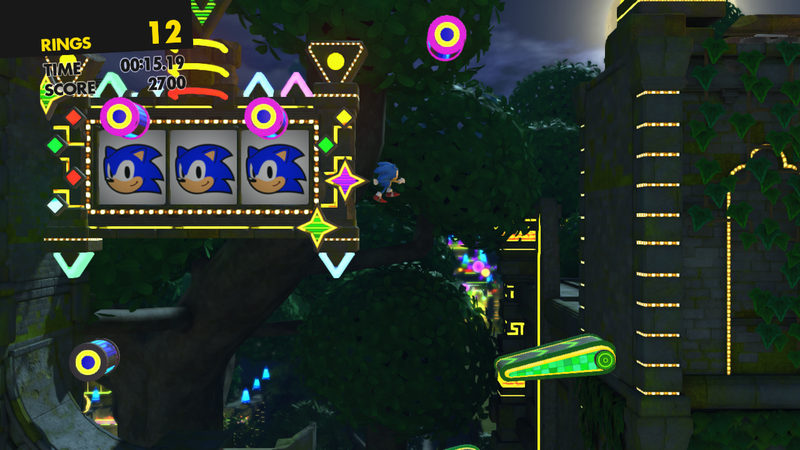 Instead of the standard spin-dash attack, avatars use ‘Wispons’ – a leftover from Sonic Colors. These include lightening whips, flamethrowers, and a screen-filling void that inhales enemies and nearby rings. Oddly, rings act differently in Forces. 100 is the maximum that can be carried, and you only lose a small amount when hit. Gaining 100 no longer bestows an extra life either, as the age-old concept of a lives system has been cast aside. Instead, the amount of retries affects your ranking. There’s a heavy focus on obtaining an ‘S rank’ on each stage, which ties in with a long list of mission objectives to clear. You don’t have to worry about striving for perfect runs too much, fortunately, as it’s still possible to achieve an ‘S rank’ even after dying a few times. The classic Sonic formula is shaken up elsewhere. A world map – complete with a suitably dramatic main theme – allows missions to be freely picked. The story is spread across 30 stages, with most featuring a cut-scene at the end. 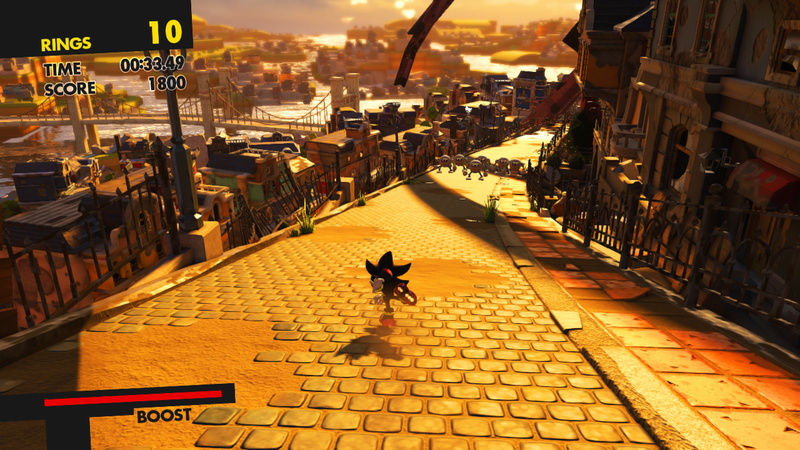 It’s easily the best storyline we’ve seen in a Sonic game, tying in characters new and old – including an intriguing new villain – and slowly building up to a full-scale climactic battle. Missions feature ‘comms chatter’ too, padding out the story further while helping to convey a sense of global war. The world map is updated regularly with new missions, varying from one-shot ‘SOS calls’ to smaller bonus stages with themes such as vanishing floor tiles. While this set-up certainly provides lots of variety, it sadly robs the whole experience of a sense of progression while also harming consistency. Here’s a Sonic game that’ll have you in Green Hill one minute, and inside the mechanical Death Egg the next, before disrupting the story to replay a past mission with somebody else’s avatar. All the while you’re forced to contend with minor variations of the control scheme – characters have different abilities to one another, and in some instances, their attacks are mapped to different buttons. SEGA’s logic is a little sketchy here – Shadow can’t perform a spin dash, for instance. Putting a dampener on consistency further, the levels are incredibly short and tend to abruptly end. They come and go like fleeting moments, with only the odd flashy set-piece here and there to separate them. It’s easy to tell which levels the developers were proud of, as a select few are recycled more than others. Being forced to play through these standouts several times during the game’s 5-6 hour duration comes off as unnecessary padding. On the flipside, some stages are underused. The new Casino Forest zone only appears for a couple of short stages. Another new zone is simply called ‘City’ and is as generic and non-descript as its name suggests. Weirdly, the side-scrolling stages starring ‘Classic Sonic’ – a highlight in Sonic Generations – are the weakest element. They feel as if they were constructed using a ridiculously basic level editor, with path-blocking metal boxes in abundance, and a general lack of pizzazz. The controls during these stages also feel loose and slippery. The avatars, in particular, build up momentum too quickly when running, leading to cheap and unavoidable deaths. SEGA should have picked up on problems such as this as they aren’t the usual issues associated with a 3D Sonic game. In fact, it’s very much a case of one step forward, one step back. Sonic Forces improves a lot of problems found in past games – the camera doesn’t cause any major issues, the boss battles are mildly challenging, and the cut-scenes entertain. It looks great, too – a real treat for the eyes in places, with alluring elemental effects and backdrops spread far into the distance. 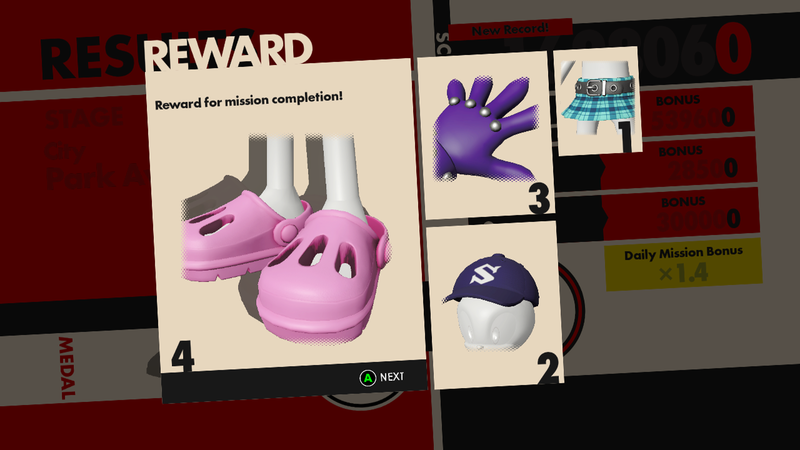 But by applying the focus on replaying past stages, and allowing players to choose missions at will, they’ve inadvertently generated new problems. Sonic Forces isn’t the worst 3D Sonic game, and by some margin, but it’s easily the most inconsistent. SEGA’s design philosophy was seemingly to take the best ideas and elements from Lost World, Generations and Colors, while adding a safe gimmick. Sadly, it’s too safe. Avatar creation is one of the most mundane ideas the franchise has ever seen, and ultimately, we’ve ended up with a game with no identity of its own. 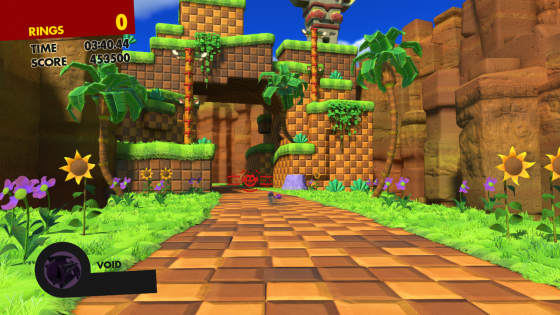 Sonic hasn’t been this bland since Sonic 3D: Flickies’ Island on the Mega Drive.